Anna Sui La Nuit De Boheme Eau De Parfum is dedicated to the bohemian life. 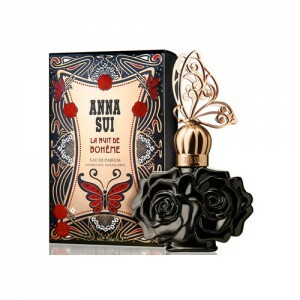 Anna Sui La Nuit De Boheme Eau De Parfum - 75ml. is different from the name of the toilet is not only the color of the bottle, but also flavor. La Nuit de Bohème Eau de Parfum - deep and mysterious eastern floral fragrance, released in 2014, a popular perfume brands Anna Sui. He is a flanker perfumes 2012 and inherited from the original bottle in an unusual form of two roses, decorated with a golden cap with a sculptural image of a butterfly. Only this time the vial was the coal-black, and the soft scent found as the shades of night, velvety tone. La Nuit de Bohème Eau de Parfum transmits secretive, seductive power that there is nothing else. Elegance and sophistication. Luxury and femininity. This fragrance has an atmosphere of mystery that captures the heart and excites the senses. It is a new fragrance collection, started publication La Vie de Boheme in 2012. First came the publication version of La Nuit de Boheme Eau de Toilette, and now Anna Sui version is Eau de Parfum in a black bottle with gold cap. Oriental floral fragrance for women in 2014. format perfume water, taking the baton from La Nuit de Boheme EDT. Perfume is dedicated to the bohemian life, he joyful, bright and sunny. La Nuit De Boheme Eau De Parfum from Anna Sui - buy and try. Top notes of bergamot, mandarin, blackberry, apple. Heart notes: magnolia, black rose, jasmine, plum, orange blossom. Base notes of patchouli, sandalwood, amber and musk.